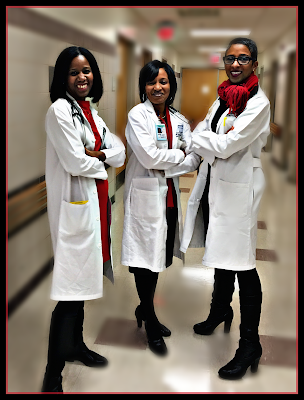 Reflections of a Grady Doctor: Image of the Day: January 13. This was the day that my sorority, Delta Sigma Theta, was founded. 103 years ago to the day. For this reason, January 13 has always been a special day. It means evening gatherings with many of my oldest, dearest friends and also, it was this special thing that Deanna and I shared. She was my favorite Delta of them all. There are other sororities. And they do amazing things in our communities and this world--there's no denying that. But. There's just something about Delta women. For as long as I could remember, wherever there was important work to be done that involved a fearless leadership, there has always been a Delta there, too. I recall being in high school and saying, "She's a Delta, too?" Eventually, I learned to not be surprised. Grady Hospital is no different. Surely our students and residents interface with many people. And it is true that a remarkable number of them are African-American women in leadership positions. So, true to our form, the lion's share of those women are members of Delta Sigma Theta. I was proud as I walked through the halls on rounds today. Periodically I'd see one of my sorors and we'd greet one another with a hug and a "Happy Founders Day!" exchange. Finally, someone said to me what I always said as a young person: "Her, too?" And proudly, I'd nod in the affirmative. Someone said something really interesting toward the end of my rounds. They said, "Isn't it astonishing to you that the majority of the black women in major leadership positions at Grady Hospital just so happen to be Deltas?" To which I quickly replied: "No. It'd be more astonishing to me if they weren't." Happy Wednesday. And Happy Founders Day to my trailblazing sorors all over the globe. Now those are some fly powerful medicine women!